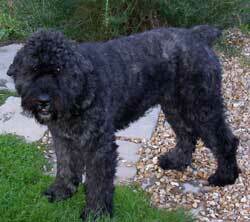 The Bouvier des Flandres is a dog breed originating in Flandres. They are used for cattle droving, sheep herding, cart pulling, and as guard dogs, police dogs, and other security dogs. Their weight ranges from 80 to 100 pounds; they are powerfully built and 'cobby', with a thick coat. These dogs lover water but are sometimes difficult to train.